Established in 1986, Excalibur Systems started with an idea, and with a desire to create and achieve. The company designed the first ARINC-429 interface card for the personal computer; and it has not looked back since. 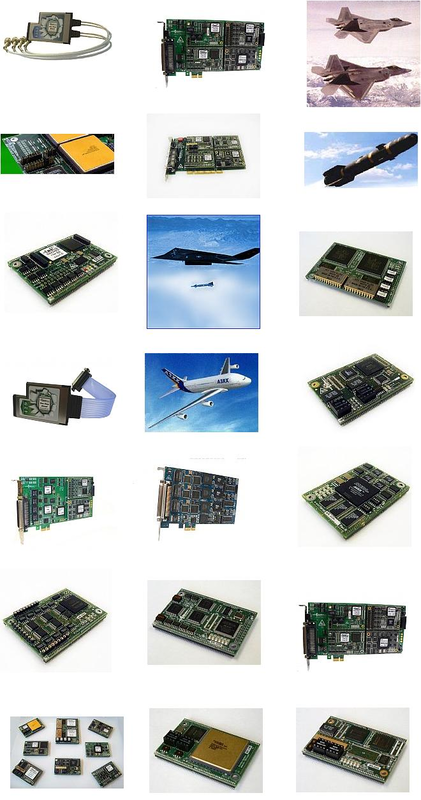 Today, Excalibur manufactures hundreds of products for the Avionics Industry. From connectors, cables, couplers and cards to sophisticated and complete systems, the company's commitment to customer service is legendary. 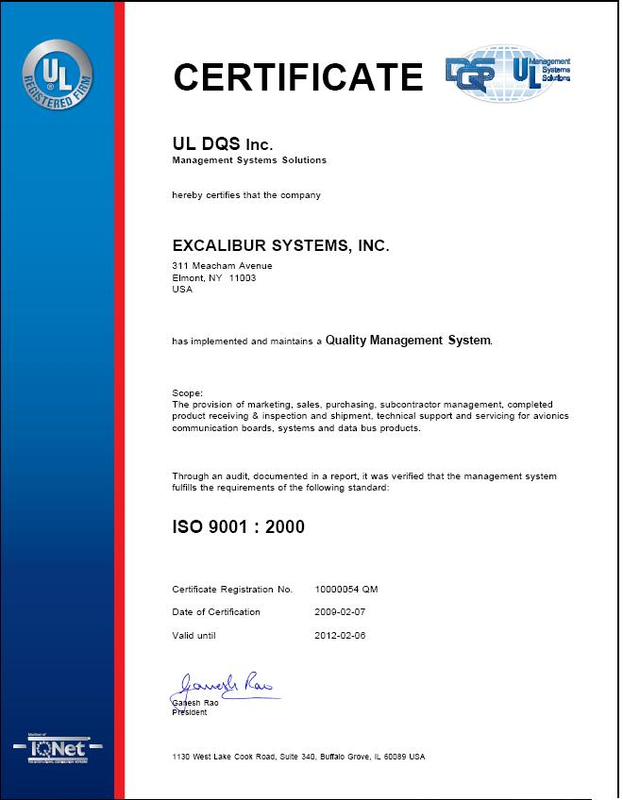 Excalibur has received numerous awards, accolades and commendations for its products and more importantly for its service and support. Excalibur builds and maintains long-standing relationships with customers, which are addressed as "partners". In today's fast paced technology market, it takes more than quality products to enable a company to consistently grow. It takes dedicated employees, who are willing and able to go the extra distance. That is the formula for success at Excalibur. More than seventy five per cent of the 45 employees have been with the company for at least ten years. 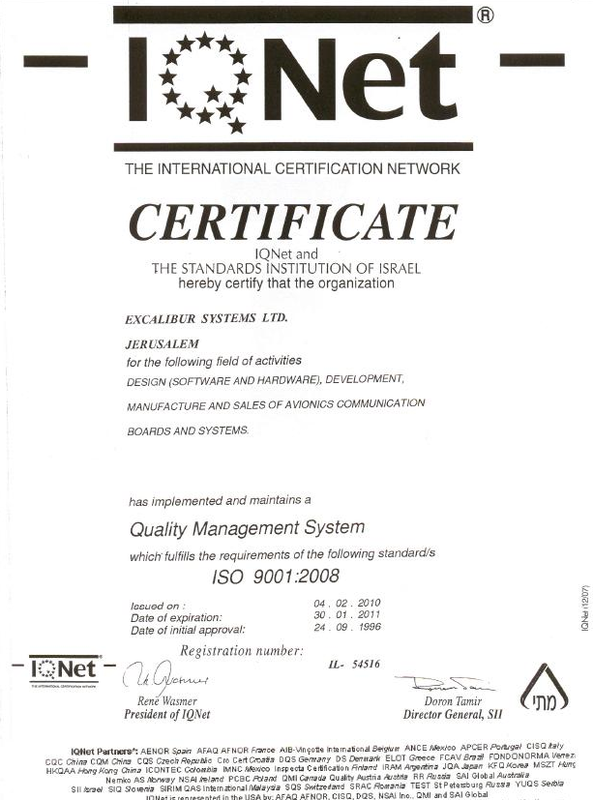 This provides Excalibur with the stability to support and maintain relationships with its partners. Excalibur Systems provides a large selection of board level products for the test & simulation, as well as, the embedded environment. Choose from a number of avionic protocols under platforms such as, PCMCIA, PC/104, PMC, PCI, Compact PCI, VME and VXI. Boards in this family have an option for either single or multi function 1553. Single function 1553 (RT validated) operates either as a Bus Controller, Remote Terminal, or Bus Monitor. Multi function 1553 operates simultaneously as a Bus Controller and/or multiple (up to 32) Remote Terminals, and/or as a Triggerable Bus Monitor. Multi function cards support error injection and error detection. All Excalibur 1553 multi function boards can be ordered with the 1760 option, which incorporate use of Checksums, Support for Header Word and Servicing the SRQ Bit. Mini Munitions Store Interface (MMSI) modules support up to eight MMSI hub ports and one composite Bus Monitor output. Each module can operate in one of three modes of operation: Remote Terminal, Bus Controller/Concurrent-RT/Concurrent Monitor, and Bus Monitor. Boards in the H009 family provide a complete solution for developing and testing H009 interfaces and performing system simulation of the H009 bus, according to the standard H009 protocol. ARINC-429 interface boards supports multi-channels in any combination of transmitters and receivers. Each of these channels feature error injection and detection capabilities. ARINC-708 / 453 for the Weather Radar Display Databus. The EXC-664PCIe board is an ARINC-664 test and simulation board designed to help integrate avionics suites, and can simulate up to two End Systems with full dual redundant support for receive and transmit operation. The board also contains room for two standard 4000 modules that can support multiple channels of other avionics communications protocols including MIL-STD-1553, ARINC-429, Serial, Discrete, ARINC-708 and CANbus. The EXC-664PCIe/ETH board is an Ethernet test board designed to receive two Ethernet channels. The board also contains room for two standard 4000 modules that can support multiple channels of other avionics communications protocols including MIL-STD-1553, ARINC-429, Serial, Discrete, ARINC-708 and CANbus. AS5643 (FireWire) - 1394B cards support up to three fully independent nodes; each node having three full duplex ports associated with it, and 2 MB of memory for message data and control registers. Supports up to four independent channels of serial communications, each of which can be selected as RS-485, RS-422 or RS-232. Provides a complete solution for developing and testing discrete voltage-level interfaces. M4KCAN module supports up to 6 CAN Bus channels each containing 256 bytes of dual-port RAM for Data Blocks and control registers. All Data Blocks and control registers are memory mapped, and may be accessed in real time. The EXC-4000 is a family of multi-protocol test and simulation boards for PCI, cPCI, PC/104 Plus and VME/VXI computers. The M4K module can be one of many protocols that is used on a variety of platforms for the 4000 Multi Protocol Board. 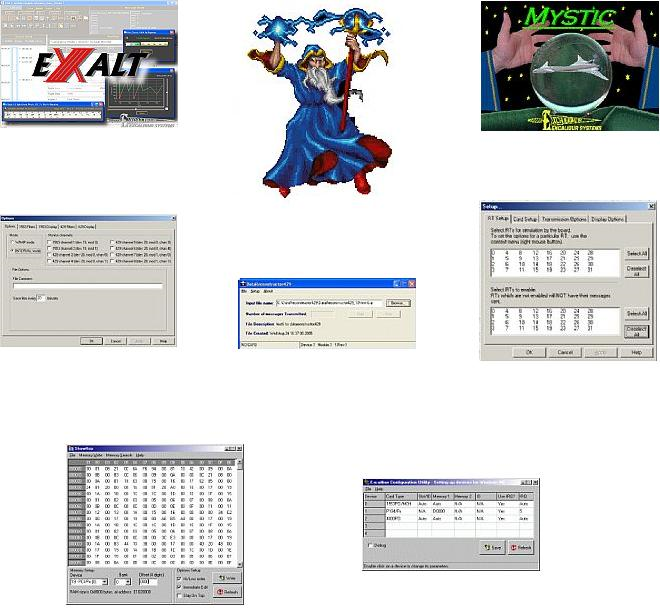 Excalibur Systems provides software utilities and applications programs to manage data communications for our products, which include Bus Controllers, Bus Monitors, Data Recorders and analytical flight Data Reconstructors. There are different applications for single & multi function MIL-STD-1553 and ARINC-429. EXALT Plus - Excalibur's new comprehensive analytical laboratory tool - is a user-friendly software monitor program that is comfortable and intuitive for users. Merlin is a richly featured program for simulating MIL-STD-1553 Bus Controllers, Remote Terminals, and Bus Monitors. Data can be monitored on screen or recorded to file for later viewing. Error injection can be simulated. Mystic allows engineers to simulate, transmit, or receive ARINC-429 data. Data can be viewed in binary, decimal or hex units, with a choice of standard and Engineering units, which can be customised as required. Excalibur's MIL-STD-1553 Data Reconstructor utility is a tool for recreating a data transmission stream from a Merlin Plus or Exalt log file. Excalibur's ARINC-429 Data Reconstructor utility is a tool for recreating a data transmission stream from a Mystic log file. ShowHex allows the user to view, search, and even modify the contents of the memory of any installed Excalibur product - enabling user-controlled start, stop and reset of the board on the fly. Use ExcConfig to assign a device number and system resources (Memory Addresses, I/O port setup, IRQ Line) to your Excalibur board. This is the method used to inform the Windows operating system that you want to assign resources to an installed board. Box Couplers and in-line couplers are the key components in the fabrication of your bus architecture. Excalibur provides a full line of standard couplers listed in the catalog as well as custom couplers to your requirements. 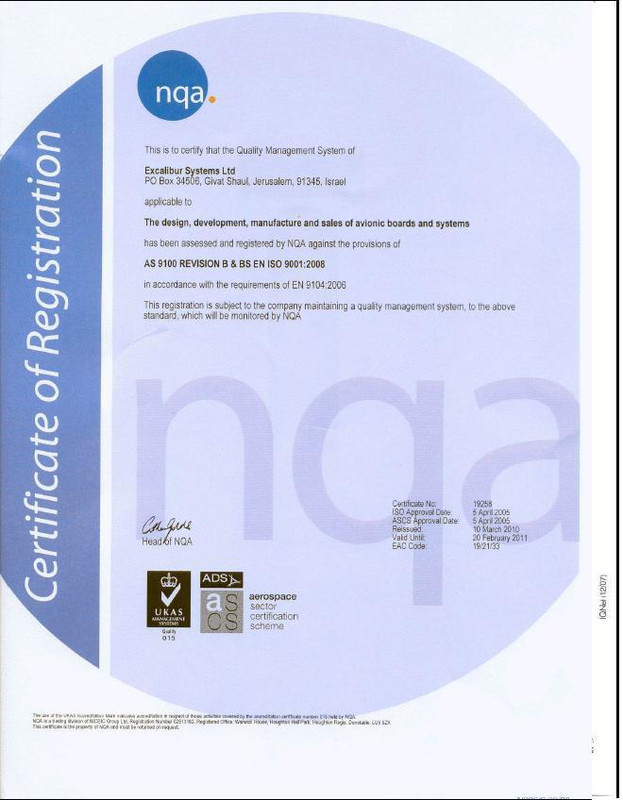 The design for our products was implemented to meet the specification requirements as well as being aesthetically pleasing. If you have a requirement for couplers, Excalibur's products are cost competitive, with delivery from stock. IN-LINE COUPLERS are predominately utilized in airborne applications but can also be used where space is limited such as testers and simulators. Couplers are provided with a standard cable length but custom cable lengths can be procured at a nominal cost. The products were designed to meet the environmental requirements imposed by the military, including the temperature range of -55°C to 125°C. Bus Switches are devices that enable system architecture to be reconfigured. This reconfiguration is mostly accomplished in the test environment and includes but is not limited to simulation of missile firing and switching in or out a new section of bus interface. Excalibur Systems is the only manufacturer of devices (ESI-R24/27/28) that contain their own TTL driver circuitry that allows them to be directly driven from a computer. The ESI-1553RPT Repeater box was developed for customers who need to extend the existing length of their bus or provide the capability to utilize long stubs or to connect a number of devices to a single stub. The box was implemented using simple signal detection and switching techniques to minimize the delay through the device. Delay through the unit is in the range of typically of 700 nsec. to 900 nsec. maximum. Each connection to the bus is made through the implementation of a bus coupler in various configurations. Standard MIL-STD-1553 transceivers and digital signal processing are utilized to steer and shape the received signals, and retransmit them in the correct direction. Each of the two connections [J1 and J2] is bi-directional. Its type of connection is defined specifically in each configuration as marked on top of the box. A signal received at either connector will enable the signal to flow through towards the other connector. P1 provides the power connection to the device which is 12-36 VDC (28V nominal).The unit is intended to operate within the temperature range of -40º to 85º C.
Excalibur provides a variety of terminators that includes, 78 ohm, 3K ohm and others. Excalibur Cable Plugs are built to last with superior mechanical performance and rugged physical properties. Excalibur Cable Jacks are built to last with rugged physical properties and extreme reliability. Excalibur's MIL-STD-1553 cables offer optimum flexibility, shielding, and performance. M17/176 -00002 and TWAC-78 -1F2 are 200C, Hi-Temp cables for MIL-STD-1553B data bus applications. 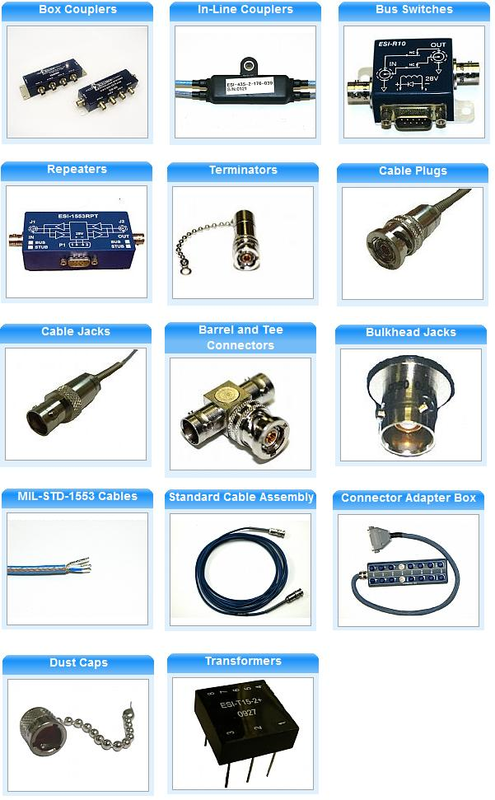 Excalibur has a wide variety of "Standard Cable Assemblies" at different cable lengths. Using MIL-STD-1553 boards with many channels can create a hardship finding the right cable to connect to. With Excalibur's Connector Box finding the needed channel and bus is made easy. In this section we have seperated out a number of products that are specific to embedded systems. You can find conduction cooled PMC and VME cards for MIL-STD-1553 / 1760 and ARINC-429 / 708 protocols, as well as, a section for PC/104 systems, handheld recorders and rugged laptops. The EXC-1553ccPMC/Px(S) is a multi-channel (up to four) MIL-STD-1553 interface board for conduction cooled PCI Mezzanine Card compatible computers. The EXC-1553ccVME/Px(S) is a multi-channel (up to sixteen) MIL-STD-1553 interface board for conduction cooled VME systems. The EXC-1553ccPMC/Px(S)-1760 is a multi-channel (up to four) MIL-STD-1760 interface board for conduction cooled PCI Mezzanine Card compatible computers. The DAS-429ccPMC/RTx is a conduction cooled PMC card which supports five, ten, fifteen or twenty ARINC-429 channels. The DAS-429ccPMC/RTxD is a conduction cooled PMC card which supports five, ten or fifteen ARINC-429 channels and eight Discretes [4 Inputs and 4 Outputs]. The EXC-708ccPMC is an ARINC-708 /453 interface board for conduction cooled PCI Mezzanine Card systems. The EXC-4500ccVPX is part of the 4000 family of multiprotocol carrier boards. This conduction cooled VPX interface board has a PCI Express host interface and can support up to four independent modules: three onboard modules and one removable module. The EXC-4000P104plus is a multiprotocol P104plus interface board for avionics test and simulation applications. The EXC-PS104P power supply is a high performance DC to DC converter designed for aerospace, military and high-end industrial applications. Excaliburs Dragon is an advanced, ruggedized PC104 and PC104+ system in an enclosed, modular casing. 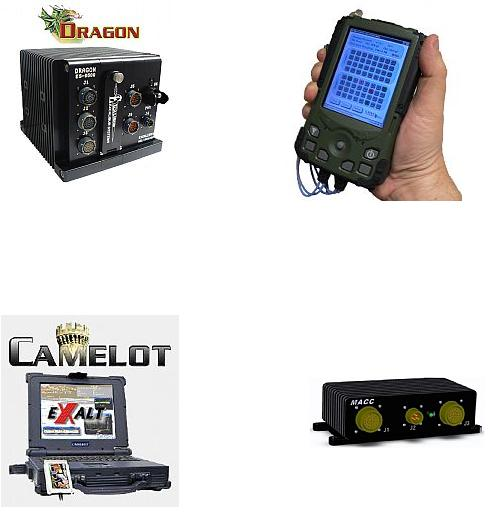 The system is appropriate for use in data acquisition and recording for any combination of ARINC-429, MIL-STD-1553, Serial, Discrete or similar types of communication. The hand-held Lance is a cost-effective solution for portable data recording of MIL-STD-1553 or ARINC-429 avionic communication buses. Excalibur provides protable rugged systems designed to work with one or more of Excalibur's PCMCIA cards. Excalibur's MACC is a complete Minature Airborne Communications Converter designed to convert bi-directional messages. Small, lightweight and with low power dissipation, the MACC is the perfect solution for airborne communications incompatibilities. After many years of experience in the design and manufacturing of board level products, Excalibur now brings its customers complete solutions on a systems level. Excalibur provides systems designed to withstand harsh environments such as our Data Recorders that can be fitted into the aircraft or the handheld monitor for checking out the health of the system on the flight line. Excalibur’s Dragon is an advanced, ruggedized PC104 and PC104+ system in an enclosed, modular casing. The system is appropriate for use in data acquisition and recording for any combination of ARINC-429, MIL-STD-1553, Serial, Discrete or similar types of communication. The modular, stackthrough design of the PC104/PC104+ platform allows you to build a tailormade configuration based on Excalibur’s extensive range of boards while permitting the integration of other commercially available PC104/PC104+ cards. This modularity also enables the Dragon to be modified or upgraded at any time as technology and requirements change. 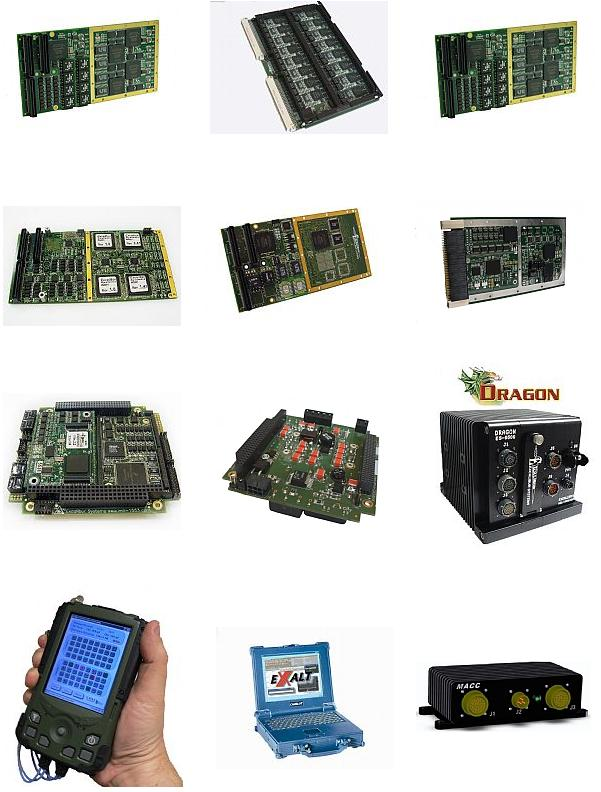 The Dragon includes a processor card, a power supply and a selection of Excalibur’s ARINC-429 and MIL-STD-1553 boards. Each unit is heat sink protected, enabling an internal operational temperature range from -40°C to +85°C. The unit comes with military style waterproof connectors and seals between rings to impede water incursion as well as EMI/RFI protection to the inner electronics. Its compact footprint allows for versatility when space is at a premium. The hand-held Lance is a cost-effective solution for portable data recording. Thin and lightweight, the Lance meets both the tough, environmental specifications of commercially available equipment, such as waterproofing and impact resistance, and the stringent EMI/EMC requirements. MIL-STD-1553 units can be purchased with monitor only or with 1553 multi function capability. The multi function units are provided with drivers, monitoring & recording application and data reconstructor software. Camelot is a ruggedized laptop computer featuring a full sized display that is able to operate in severe environmental conditions, such as water and dust. The unit has been designed to work with one or more of Excalibur’s PCMCIA cards. An optional chasis that allows PCI or PCI Express cards is available as well. The unit comes with the cards and software already integrated. When designing or upgrading avionics systems we are often faced with the task of integrating components that were not originally designed to work together. A control computer that communicates using RS-232 may need to control component that expects MIL-STD-1553 messages or an INS may put out ARINC-429 labels, which are needed by Multi function Display designed around RS-422. Faced with problems like these, integrators must choose between two poor options. They must either give up on one of the units in favor of another unit that may be less suitable but uses the appropriate communications spec; or they must add a computer system – often PC104 – which can translate from one unit to the other. These computers are generally large, heavy, hot, and require substantial power. The MACC is a wholly contained Miniature Airborne Communications Converter. It contains an internal microprocessor, a dual redundant MIL-STD-1553 interface, three receive and one transmit (or receive) ARINC-429 channels, two serial channels (1 RS-232, 1 RS-232/422/485), 1 Ethernet (10/100/Gigabit) and 8 Discrete I/O signals (5 can be used as an RT address instead of Discretes) . The processor may be programmed to convert data in real time from any format to any other format. Its small size, weight, low power requirements and integrated heatsink make it an excellent candidate for solving airborne communications incompatibilities.